The canonical childhood “Teddy bear” originated, in part, from the story of President Theodore “Teddy” Roosevelt’s mercy, as he compassionately refused the chance to kill a bound black bear on a hunting trip in Mississippi. The heroic tail of non-violence was immortalized shortly after its happening in a Washington Post article, evolving into the iconic youthful companion. In a small exhibition room on the upper floor of Reykjavik Museum of Art, the fate of hundreds of Teddy bears proves to be far less merciful than Roosevelt’s. Hauntingly beautiful, in Kathy Clark: bears; truth, their dismembered, embalmed, bound, and skinned bodies transform the space into an unnerving depository of childhood carcasses and spectral friendships. 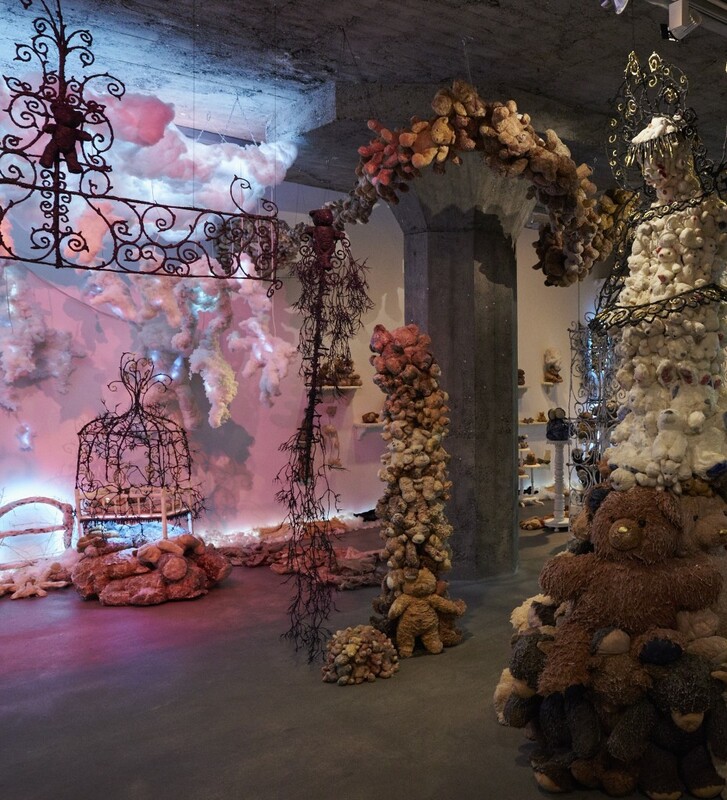 The installation invites the viewer into a broken terrain of abandoned bears that feels like a childhood fantasy on the brink of becoming a nightmare. Clark’s carefully controlled vision does not rely solely on the facile emotional pull of nostalgia, but conjures instead a sophisticated space permeated with abuse and embrace, fantasy and nightmare, temporality and regeneration. Korean-American artist Kathy Clark (b.1957) grew up in the suburbs of Chicago, IL. She left the Midwest to complete her undergraduate degree from San Diego State University and then studied installation while completing her MFA at San Francisco Art Institute in 1985. After exhibiting and working in California, around 2005, she relocated to Iceland where she has resided for ten years. Kathy Clark: bears; truth is her first major solo exhibition with the well-established Rekjavik Museum of Art, Hafnarhus. At her core, Clark is a collector. By actively foraging for discarded materials and displaced ephemera, she often finds inspiration for her practice in the human history and residual narratives that remain as traces of the objects she collects. In studying their materiality, Clark channels the residual anger of a broken dish or the lingering sense of security in a monster-fighting night-light. In Iceland, this collecting practice led her to a fateful encounter with a crate full of discarded bears, which jump-started a three-year collecting and donation process for unwanted Teddy bears. This encounter is what resulted in the thousands of bears that make up the exhibition. Commenting on the bears, Clark stated, “These bears collected the presence of the child. They know things.” But for Clark, their spectral power is not hinged on their physical preservation, awakening endless possible treatments for the found objects from de-stuffing, dismembering, encasing, to refiguring. Walking into Clark’s land of abandoned toys is an experience of full sensory immersion; eerie nursery songs play overhead the space in an off-tuned melody, while the grandeur of the bear formations plays with scale making an average size adult feel small around the toys’ monumentality; twinkle lights and soft pastel colors are initially inviting but then push back with displeasure as pastel gives way to the opaque saliva-like quality of their wax casings. In one corner, an embroidered life-size bear appears like an anchor in the melting and deconstructed world, but he leads the viewer into a disarming space with a crib on the floor holding a bear-skin flanked by guardians whose bodies are an illogical jumbling of multiple limbs, missing heads, and heaving masses. Along the farthest wall from the entrance, a line of bears remains intact in their original toy shape and is organized in ascending gradation of color. 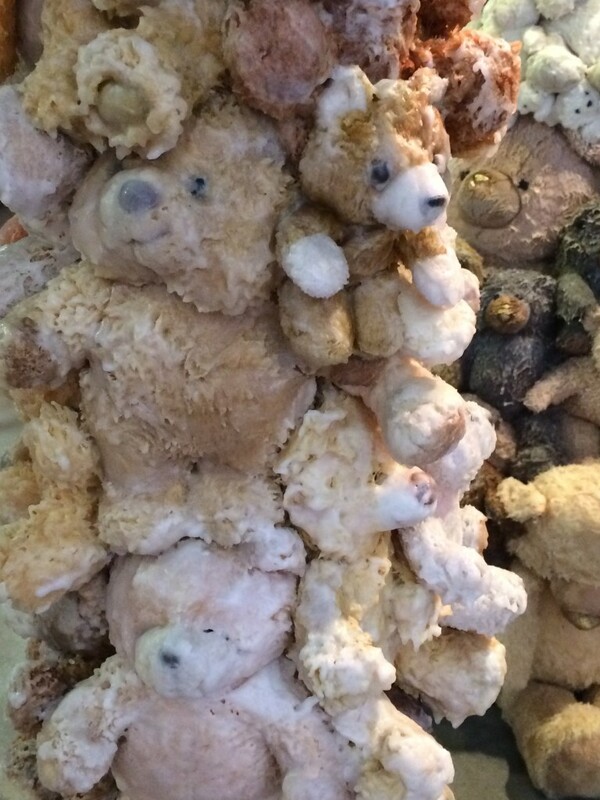 But just as the rest of Clark’s installation, their preciousness is not to be trusted, and upon closer study each bear has been stunted and bound by thick wax encasing that at times fuses their limbs together and onto the surface of the shelf. Each bear in the gradated line up is adorned with a small adhesion containing found text, hand written in cursive and reminiscent of the shameful red A in The Scarlet Letter. The wax texture that encases most of the bears highlights their weathered history, so that each lump, mark of damage, or sign of misuse is preserved for studying. In this, Clark’s conceptual interest in the bears’ past lives, in their past role as children’s companions or victims, is palpable across the installation. Bears; truth is approachable, grotesquely beautiful, and steers clear of feeling like a thrift store turned art project. Through Clark’s carefully shaped vision, one is not didactically fed a push for nostalgic penance towards our own forgotten playthings, but encouraged to navigate a range of references, emotions, and fantasies. In considering the referential qualities of Clark’s work, the little blisters and tendrils that adhere to many of the sculptural surfaces feel reminiscent of the obsessive quality of Yayoi Kusama’s installation work. The arching and bending roundness of the large formations also places her in conversation to the high-gloss work of LA based artists The Hass Brothers. As her first major solo exhibition in Iceland, the work embraces themes of childhood, sentimentality, violence, and dreams with a maturity that can only come from a carefully developed artistic voice. In true memento mori fashion, each bear is a ghostly reminder of our past, our secrets, and the temporality of all things precious. Kathy Clark: bears; truth ran through October 18, 2015 at the Reykjavik Museum of Art. October 30, 2015 | Filed under Art Seen: International.